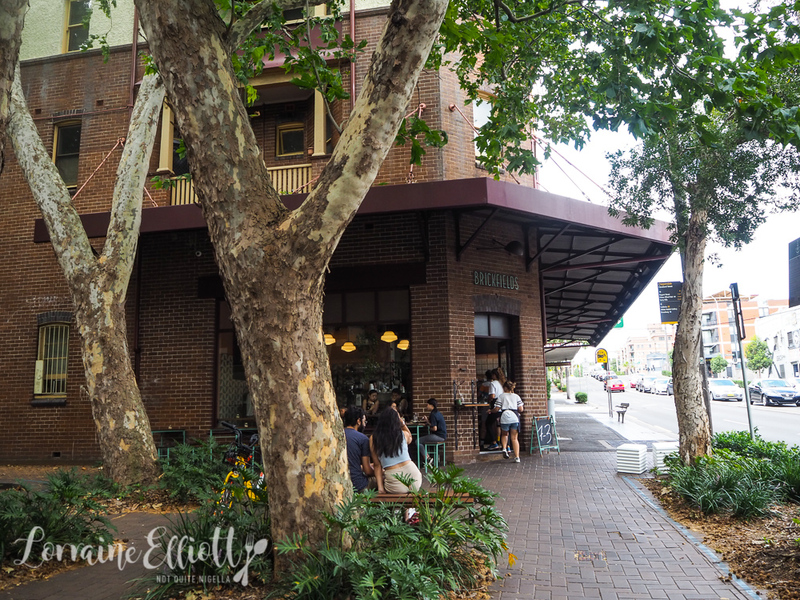 Brickfields is a corner bakery that serves delicious European style breads and sourdough loaves. 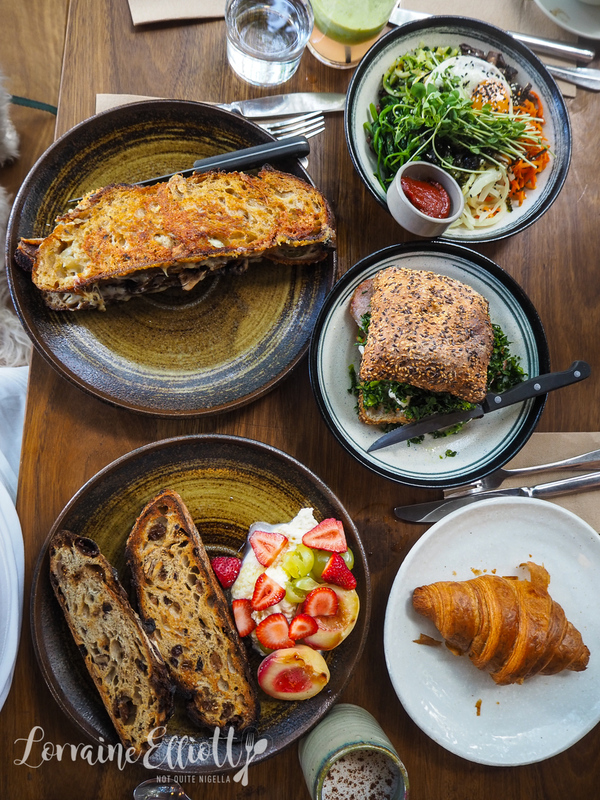 During the day the cafe serves up hearty dishes topped with enormous slices of toast, pastries and cakes. And there's a little bonus for dog owners in that there is a dog friendly section outside. Having avoided indoor rock climbing with the excuse that I didn't want to cut my nails, the task of finding a place to eat that satisfied everyone fell to me. 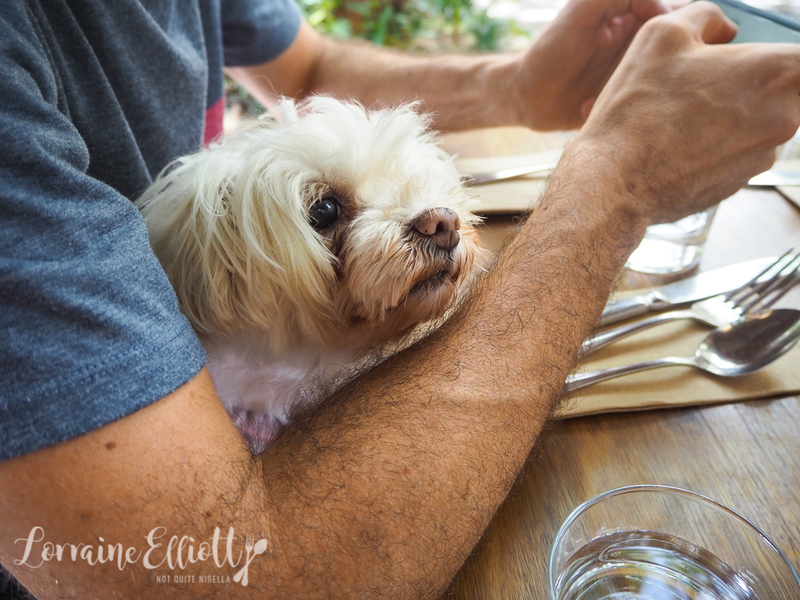 The only thing is that it needed to meet Nina's requirements (near Alexandria, inexpensive, bakery with croissants) and one of ours (dog friendly). 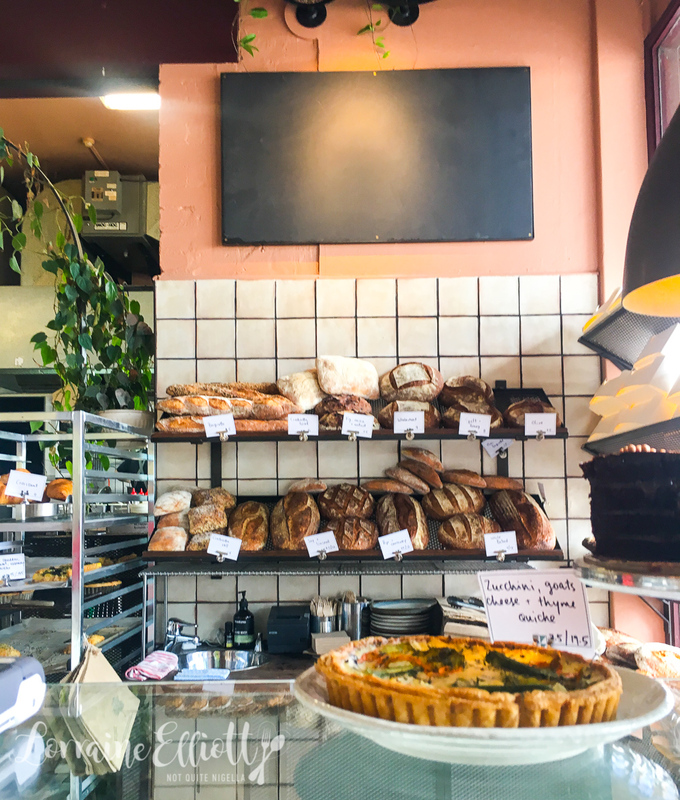 I suggested Brickfields bakery on the corner of Cleveland and Balfour Streets in Chippendale. It's 1pm when I arrive with Mochi and the two of us wait outside for an outdoor table. They tell me the wait is around 20 minutes and sure enough, 20 minutes later a table frees up just as Mr NQN, Nina and Garth arrive. 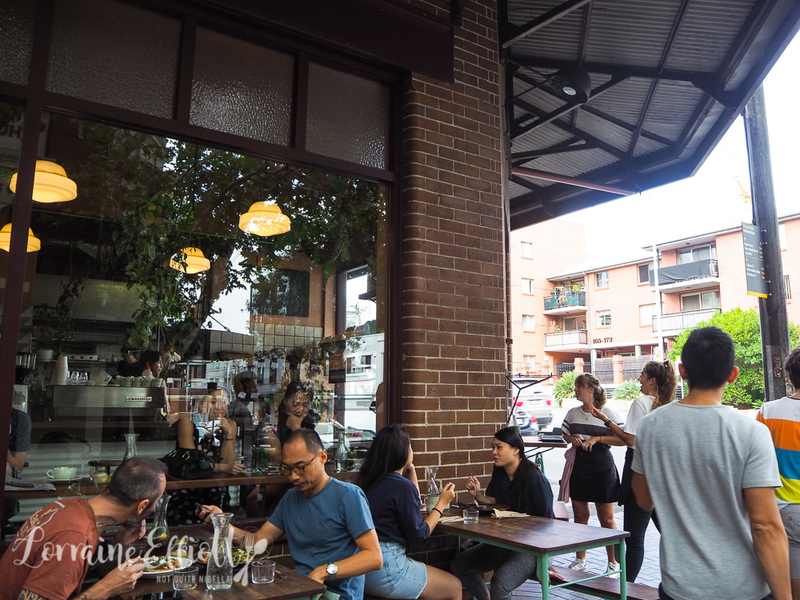 The cafe is so popular that they set up small tables by the outdoor benches for people to enjoy their takeaway at. Because the other three have been climbing they're ravenous so I do the usual ordering for everyone. 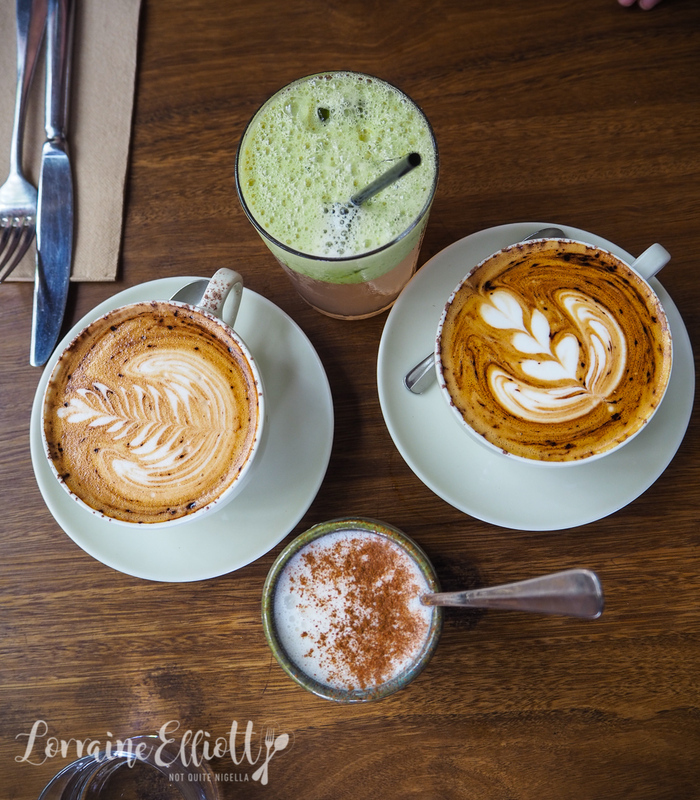 Garth is intrigued by a macadamia milk cappuccino which is pleasantly creamy while Mr NQN gets a pear, cucumber, lemon and mint juice (it is a bit strong on the lemon whereas we would have loved more pear and cucumber). I order a warm milk, malt and honey because I love malt and it doesn't disappoint with its strong malty flavour. I try some of Nina's fig and walnut toast. My first thought is "There's no butter!" but of course that's the last thing healthy Nina wants. 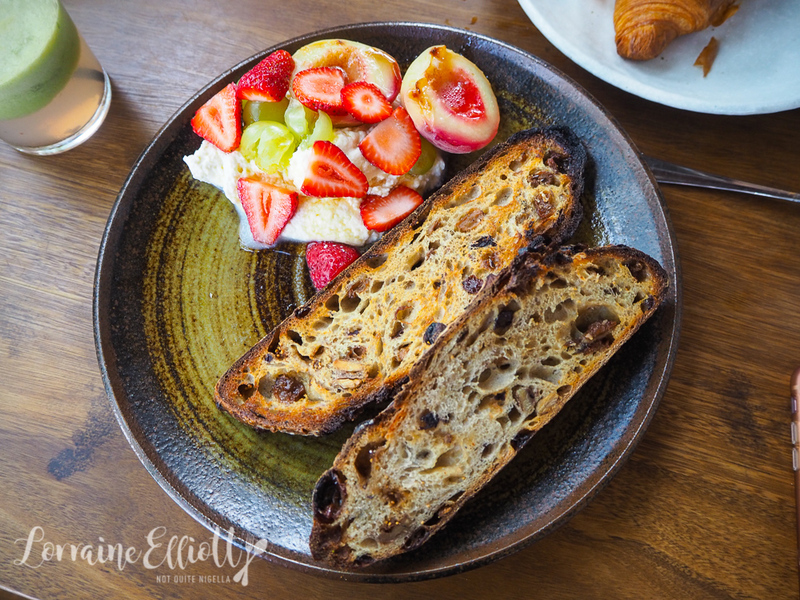 The ricotta is creamy with a touch of sweetness to it and it comes with roasted white peach halves, strawberries and grapes. We were recommended the bacon sandwich but I think that out of everything this was everyone's least favourite. 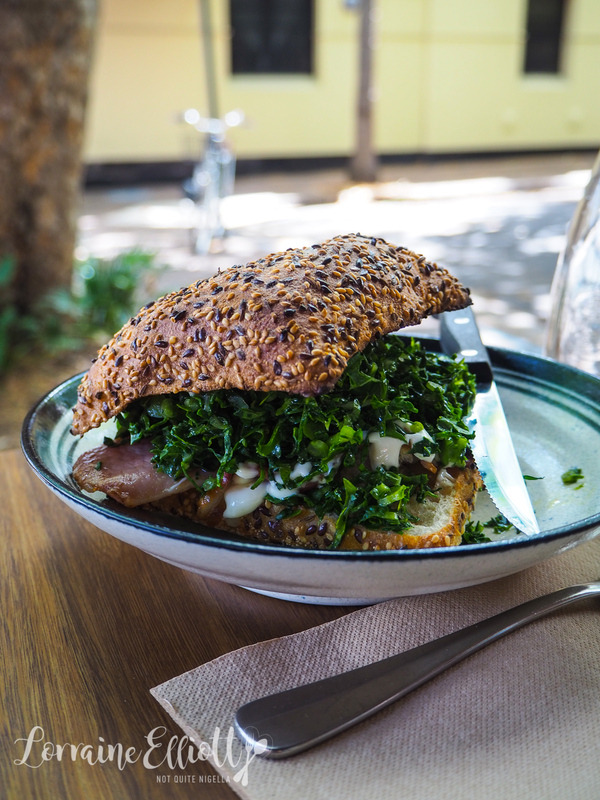 There wasn't much bacon in it, just a huge amount of kale with a bit of manchego, pickles and mayo. 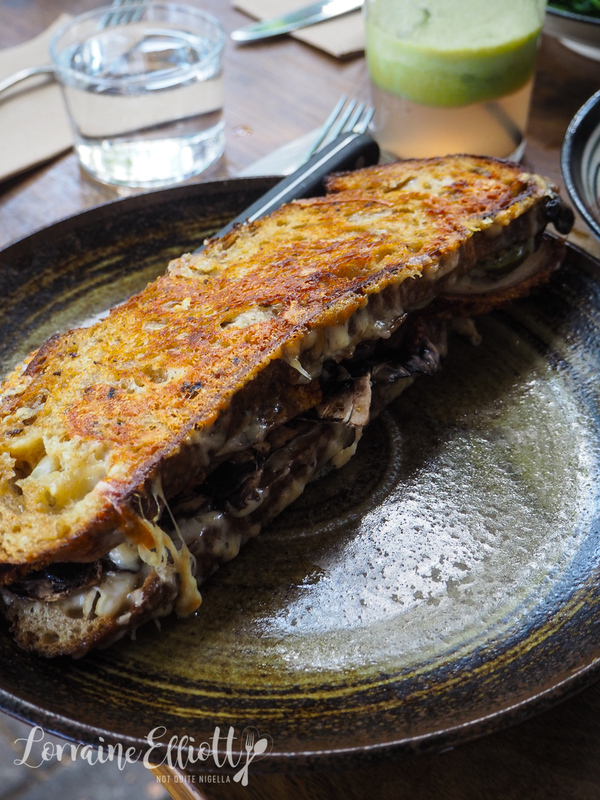 Conversely, everyone's favourite item is the mushroom melt, an enormous blistered buttery cheesy toastie with gruyere toasted until crisp on the outside and melty on the inside with mushrooms, truffle mayonnaise and jalapenos. I asked for a side of the crisp roast pork belly inside it which really made it all come together perfectly. I had all the intentions of eating healthily until I came across this and then I realised why Nina would always be the fit one and I would always be the food one out of the two of us. I was all alone here. 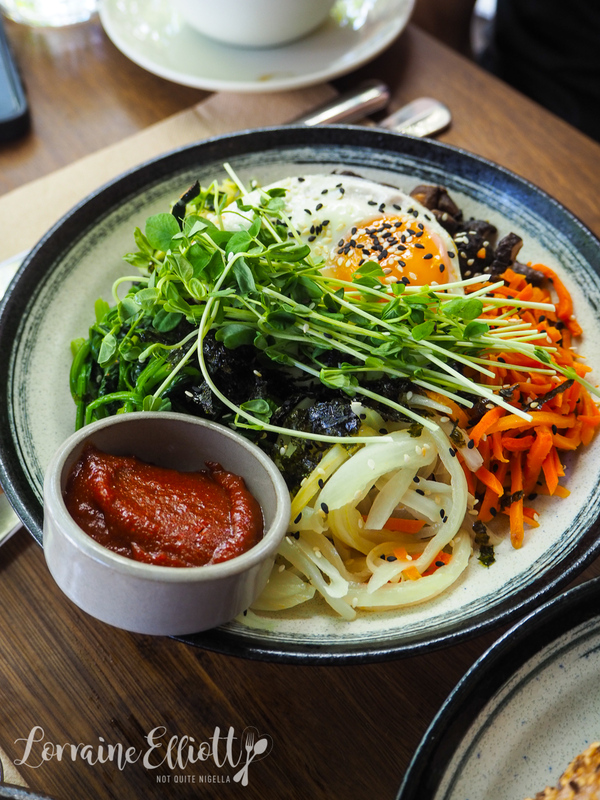 I really liked the bibimbap bowl with purple rice, shiitake mushrooms, nori, carrots, onion and a fried egg as well as gochujang sauce on the side. I thought Nina would love it but she didn't and neither did anyone else which is odd because I could have eaten the entire bowl. We were completely full and everyone comments about the generous servings here. But I had already saved stomach space for the cake. I was interested in how kaya would work in a chocolate cake. 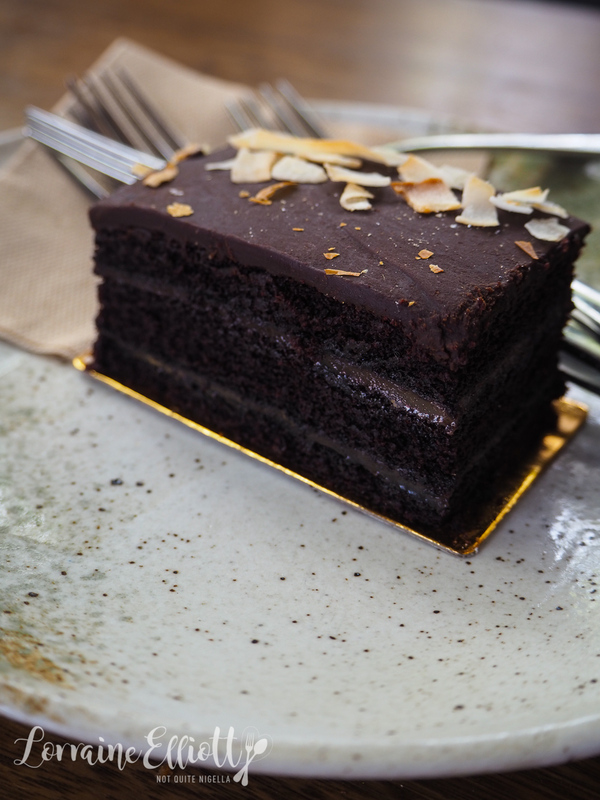 The cake itself is a vegan chocolate cake that is very light (quite similar to this one) and the kaya gives it a little moisture and sweetness which is quite appealing. So tell me Dear Reader, do you find it hard to find places to eat at that satisfy everyone? And do you have to have butter or a spread on your toast? And how do you feel about kale? restaurant Instagram's darling: Cuppa Flower!